Pat Parker -- that revolutionary, raw and as they used to say, "right-on sister" -- would be celebrating her fifty-fifth birthday in 1999 had she not died of breast cancer ten years ago. To honor her work and call attention to the significance of her contributions, Firebrand Books is publishing a new, expanded edition of her classic, Movement In Black. With an incisive introduction by Cheryl Clarke, celebrations/ remembrances/tributes from ten outstanding African American women writers, and a dozen previously unpublished pieces, Movement In Black is a must read/ must have on your book shelf. 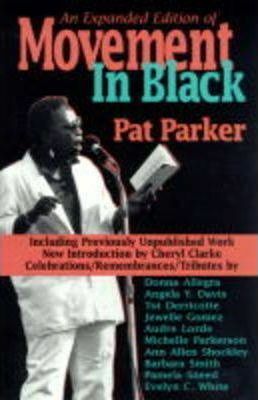 Whether she was presenting her poetry on street corners, performing with other women -- writers, musicians, activists -- in bars and auditoriums, rallying the crowd at political events, preaching to the converted, or converting the ill-informed, Pat Parker was a presence. She wrote about gut issues: the lives of ordinary Black people, violence, loving women, the legacy of her African American heritage, being queer. She was a woman who engaged life fully, both personally and as a political activist, linking the struggles for racial, gender, sexual, and class equality long before it was "PC" to do so. She died as she lived -- fighting forces larger than herself. The publication of Movement In Black is an opportunity, both for those who were around the first time and those who are new to her work, to experience and enjoy Pat Parker's power.